Cashew White Chocolate Toffee has a deep, dark burnt sugar taste that complements the salty cashews and sweet white chocolate. The brown sugar and the high cooking temperature give the toffee a smoky, rich flavor that’s much deeper than traditional toffees. The nuts add crunch and savor, and the white chocolate ties it all together with a rich sweetness. Place the butter, sugar, water, and salt in a medium saucepan over medium-high heat. Stir until the sugar dissolves and the butter melts. Insert a candy thermometer and continue to cook, stirring frequently, until the temperature reads 295-300. Once at the proper temperature, remove the pan from the heat and add the vanilla and 1.5 cups of cashews, reserving the remainder for later. Stir until well-combined. Pour the candy onto the prepared baking sheet and spread it into a very thin layer. Allow it to set at room temperature until completely hard. Place the white chocolate in a microwave-safe bowl and microwave until melted, stirring after every 30 seconds to prevent overheating. 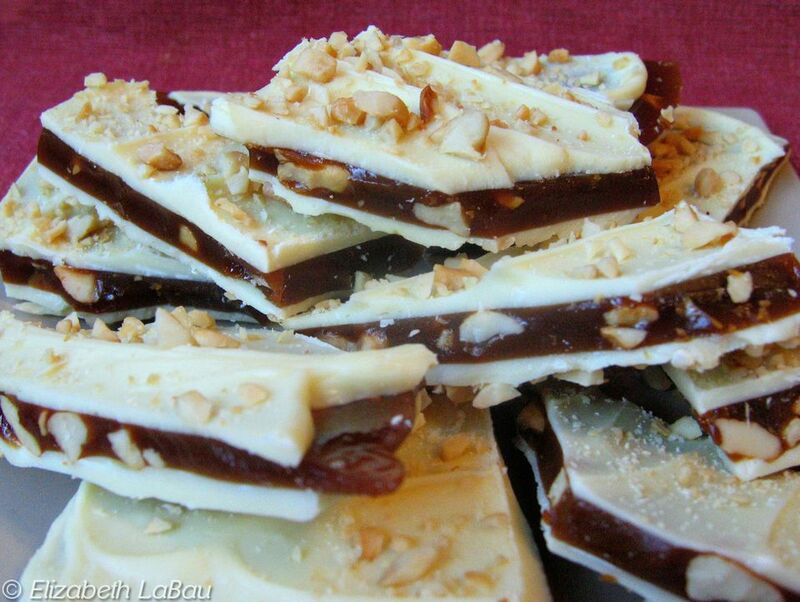 Spread half of the white chocolate on top of the toffee, spreading it into a smooth, even layer. Sprinkle the top with half of the remaining cashews and gently press down to adhere them to the chocolate. Refrigerate the toffee to set the chocolate, about 10 minutes. Once set, peel the foil from the back of the toffee, invert it, and spread the remaining white chocolate on the back, sprinkling the top with chopped cashews. Refrigerate the candy once more to set the white chocolate. Once the chocolate is firm, break it into small irregular pieces by hand. If your house is fairly cool, Cashew White Chocolate Toffee can be stored in an airtight container at room temperature. If it is fairly warm, it is best stored in the refrigerator for up to a week. For best taste and texture, serve at room temperature. Cake Batter Chocolate Bark Tastes Like Cake Batter!